The Apple A9X is a 64-bit ARM-based system on a chip (SoC) designed by Apple Inc. It first appeared in the iPad Pro, which was announced on September 9, 2015 and was released on November 11, 2015. The A9X has the M9 motion coprocessor embedded in it, a new innovation not seen in previous chip generations. It is a variant of the A9 and Apple claims that it has 1.8 times the CPU performance and 2 times the GPU performance of its predecessor, the A8X. 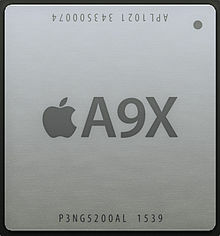 The A9X features an Apple-designed 64-bit ARMv8-A dual-core CPU called "Twister". It offers double the memory bandwidth and double the storage performance of the Apple A8X. Unlike the A9, the A9X does not contain an L3 cache due to its significant DRAM bandwidth. The A9X is paired with 4 GB of LPDDR4 memory in the 12.9" iPad Pro and 2 GB of LPDDR4 memory in the 9.7" iPad Pro with a total bandwidth of 51.2 GB/s. This high bandwidth is necessary to feed the SoC's 12-core PowerVR 7 Series GPU. The RAM is not included in the A9X package unlike its sibling, the A9. The A9X uses the same NAND interface as the A9, which uses an Apple-designed NVMe-based controller that communicates over a PCIe connection. The iPad Pro's NAND design is more akin to a PC-class SSD than embedded flash memory common on mobile devices. This gives the iPad Pro a significant storage performance advantage over competitors which often use mSATA or eMMC to connect to their storage systems. ^ Joshua Ho. "iPhone 6s and iPhone 6s Plus Preliminary Results". anandtech.com. ^ a b Joshua Ho, Ryan Smith. "A9's CPU: Twister - The Apple iPhone 6s and iPhone 6s Plus Review". anandtech.com. ^ "Apple Introduces iPad Pro Featuring Epic 12.9-inch Retina Display" (Press release). Apple. September 9, 2015. Retrieved September 9, 2015. ^ Chester, Brandon (September 9, 2015). "Apple Announces the iPad Pro and iPad Mini 4". AnandTech. Retrieved September 9, 2015. ^ "Apple's new iPad Pro is an expansive 12.9 inches, available in November". Ars Technica. Retrieved 9 September 2015. ^ "More on Apple's A9X SoC: 147mm2@TSMC, 12 GPU Cores, No L3 Cache". AnandTech. Retrieved 30 November 2015. ^ "The Apple iPad Pro Review". Retrieved 25 January 2016.